When your family takes a cruise ship vacation, you expect the cruise ship to provide a heightened level of care and safety. You and your family spent a significant amount of money and believe that you deserve to be pampered in absolute protection. Unfortunately, all too often, cruise ships are operated when they’re not in the best condition and a cruise ship accident may occur because of this. When a cruise ship doesn’t take the necessary care in maintaining their ships, terrible tragedies can occur. A ship is expected to ensure that all of their facilities are in correct working order—from the lawn chairs to the engine propellers. If they skip maintenance steps or ignore warning signs, dangerous situations may arise and you or your family may suffer because of them. 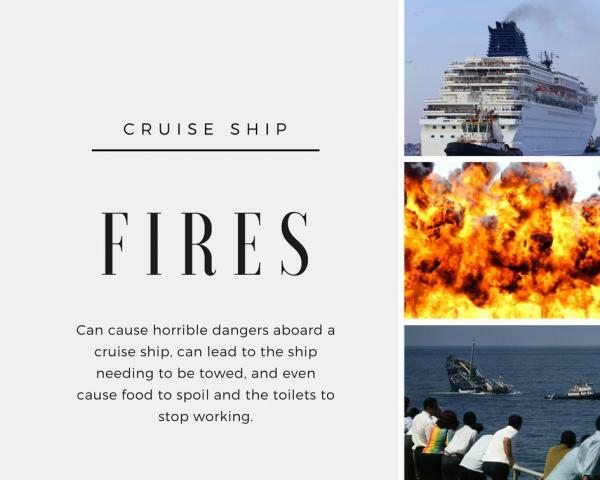 If you’ve been on a cruise ship that has had a fire or malfunction of any type, you may have recourse to file a lawsuit. Our team of Miami cruise ship injury attorneys can help you and your family seek retribution for the bad standard of care you received. Please contact us today at 305-371-8000 to schedule a free consultation. We proudly serve Miami, Florida, and cruise ship goers nationwide. A fire aboard a cruise ship can lead to severe trauma and personal injury. An engine fire may cause a cruise ship to list, or tilt, which may also cause the ship to take on water or even sink. Engine malfunctions have also left passengers stranded at sea aboard an uncontrollable ship. It can also cause the boat to lose power to the sewage systems and the air conditioning. Food may even become infected with bacteria if the engines affect the food storage systems. When something goes wrong on a cruise ship, you need an experienced attorney to represent you as you seek justice from the injury, trauma, or loss you sustained on what was supposed to be a relaxing, peaceful vacation. On February 13, 2013, the Carnival Triumph cruise ship left Galveston, Texas for a seven-day cruise with 4,200 passengers onboard. Carnival’s poor maintenance of fuel lines and filters in the generators in the engine room caused the fuel to leak. This caused a fire, and the fire caused the ship to lose power while it was off the coast of Mexico. For some reason which is known only to Carnival at this point, all of the diesel engines which are supposed to provide power to propel the ship and to provide electricity to run the ship went out with this fire. There is supposed to be complete redundancy in these systems and yet there was not. This points to poor maintenance and poor judgment on taking this ship out to sea. Carnival decided not to take the ship back to Cozumel or to Progresso, Mexico, the site of two close cruise ports. Instead, Carnival decided to try to get the ship all the way up the Gulf of Mexico to the Port of Mobile, Alabama. That meant that the passengers on the ship were subjected to at least four days of no running toilets (the toilet system on ships are vacuum-activated and requires power to move the sewage). Sewage was leaking out of the toilets and onto the carpets in cabins, passenger hallways, and down the walls. To read the Court’s Motion for Summary Judgment by the Plaintiffs on liability, click here. This opinion will be significant in the case of any catastrophic event or fire which occurs on a cruise ship. Cruise ship engine fires can have extremely serious consequences to your health and well-being, and in the instance of the 2013 Carnival Triumph disaster, their negligence was glaring. First, Carnival knew the vessel had major maintenance issues on the voyage, including an engine problem which affected propulsion to the extent that the departure was delayed for hours. Also, passengers on the Carnival Triumph voyage before this one indicated that the ship listed, that is tilted, on that voyage. A sudden and otherwise unexplained list can indicate that the stabilizers—which run on electrical power—were not functioning correctly. An engine fire is a significant issue and can cause problems with the large diesel power systems which run the ship. This is serious because the engines which turn the propellers also furnish electricity for the onboard electrical systems, including electricity to run the vacuum toilet systems. Without working bathrooms, the exposure to sewage on the vessel was dangerous and it was particularly significant because it was throughout the ship. Passengers reported that the toilets overflowed with sewage and soaked carpets in the cabins and in the hallways. Most, if not all of the passengers had to step in the sewage water. Encephalitis (swelling of the brain) from mosquitoes which are attracted to water polluted with sewage. The cruise ship industry has restricted when and where you can file an injury claim. These restrictions appear in the fine print of your ticket. Cruise passengers have 180 days after an accident to provide notice to the cruise line of their claim, and of the full details. The cruise passenger is required to file suit within one year after the accident, but in the venue (location) indicated in the passenger ticket contract. For most of the major cruise lines, that place is the Federal Court in Miami, Florida. Because of these limitations, it is essential to contact an experienced Miami cruise ship attorney as soon as possible after your accident, so you can take the necessary steps to protect your rights. For a full list of where you have to file suit for each of the cruise lines and the names of the ships in service for those cruise line, please click here. For more information about cruise ship law, please visit our page on the Cruise Vessel Security and Safety Act of 2010. If you’ve been injured on a cruise ship because of an engine fire or other ship malfunction, you can pursue compensation for your injuries. As noted in the section above, there are certain rules for starting a cruise injury claim. That’s why it’s important to contact one of our experienced cruise ship accident attorneys so that we can help you seek compensation for your pain and suffering. Cruise ship owners and operators owe passengers a duty of care. It is the responsibility of the cruise line to ensure that no unreasonable risks are present on a vessel that can cause injury to a passenger. When these responsibilities are not met, and the cruise line or operators have been determined to be negligent, we can fight for you. Because every case is unique, and the circumstances regarding your injuries may be different from those of another case, the value of your claim cannot be determined until a thorough examination is conducted by our knowledgeable attorneys. If a cruise ship fire injured you or your family at sea, Miami injury attorney John H. (Jack) Hickey has the experience you need to hold negligent parties accountable for their errors and receive compensation for the trauma you endured at their hands. Mr. Hickey is nationally recognized for his experience representing victims of cruise ship negligence. If you have suffered injury onboard a cruise ship due to a fire or any other type of catastrophic event, please contact Hickey Law Firm, P.A. by calling 305-371-8000 today to schedule a free consultation with our experienced Miami cruise ship attorney. We handle our injury cases on a contingency basis. That means you do not pay us anything unless we recover money for you through a verdict or settlement. We fight for the rights of cruise ship accident victims worldwide.